The Hematopoietic Stem Cell Laboratory (HSCLab) provides production assistance for cellular therapies in a facility located on the first floor of the Hillman Cancer Center. The HSCLab was founded in 1991 in Montefiore University Hospital and moved to its current location in the Hillman Cancer Center in 2003. Its primary mission is to support the Hematopoietic Stem Cell Transplant Program, but also serves as a production facility and reference lab for other programs and institutions. 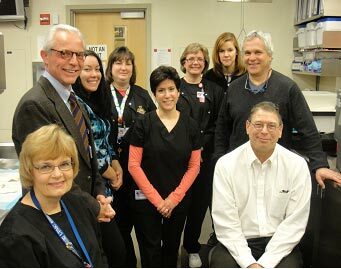 Albert Donnenberg, PhD, has directed the HSCLab since 1997, and Joseph Kiss has served as the Medical Director since 2000. The state-of-the-art HSCLab is designed with architectural features consistent with FDA recommendations for cleanrooms and controlled environment, similar to a pharmaceutical manufacturing facility. The overall design, air quality systems and architectural finishes meet regulatory requirements and are consistent with the ability to integrate equipment and all utilities into the process of cell manufacture. The HSCLab is accredited by the Foundation for the Accreditation of Cellular Therapy (FACT), CLIA (#39D0869846) and Pennsylvania Department of Health (#022322), and is registered with the FDA (FEI# 3004565478). It is CAP accredited for flow cytometry, hematology and blood typing.